By Rebecca Eastwood, an Advocacy Associate at the Columban Center for Advocacy and Outreach in Washington, DC. After a meeting with a member of the House of Lords and the House of Commons, our group stayed and chatted with those who work at CAFOD. As a self-proclaimed political junkie, when I was told our group was scheduled to visit the British Parliament at Westminster during our time here, I immediately started geeking out. Even as we woke up before the sun this morning, to catch the early train to London (to which our hero, Fr Dennis Carter, so graciously transported us), I looked forward to observing, learning and comparing our government and advocacy systems. 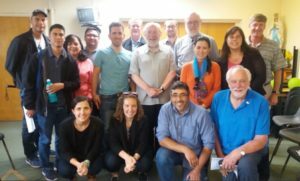 Upon arrival in London, we met with the wonderful people of CAFOD, the Catholic Agency for Overseas Development. From them, we learned about the work of CAFOD and their fourfold foundational basis: Long-term overseas development, Emergency response, Education of the Catholic community, and Tackling the structural causes of poverty. The personnel of CAFOD who worked in the splendid Romero House also told us of Columban projects in Peru that they support and educate people about, including programs for youth and the environment. After learning about their work taking the experience, knowledge and beliefs of CAFOD and its partners all over the world and using it to inform advocacy and policy, we headed over to the place where much of this work takes place: Parliament. Several Catholic Parliamentary Interns led us on a tour of the buildings, explaining the workings of Parliament and its various traditions and landmarks, such as where suffragettes chained themselves to statues during the movement for women’s right to vote. We then had the unique experience of meeting with both a Member of Parliament (House of Commons) and a member of the House of Lords. Their presentations encouraged me to reflect on the role of faith in politics. Working for a faith-based advocacy organization, this is a theme we return to again and again. Today we saw faith playing a bridge-building and community-building role in politics. From an advocacy perspective, a faith perspective allows us to bring the urgency of the conditions of those on the margins of society—refugees, unemployed, prisoners—to the attention of those in a position to alter these conditions, within a framework of values and beliefs that will reveal the success or utter failure of these attempts to alleviate suffering and establish justice. From a politician’s perspective, a faith dimension allows people to build bonds across issues and over party lines, based on a common belief. In today’s visits with advocates and policy-makers, we saw the many positive roles faith can play in politics, especially in very precarious and divisive times throughout the world. We then concluded our day with a quintessentially British meal: fish and chips. Now, as we all sit, half-asleep on the train back to Birmingham, I feel renewed and inspired in our continued use of advocating for justice and peace, through our faith.